Here is a famous story from the rich folklore of The Indian Express — where I worked for 25 years in two spells. One eminent friend asked the late Ramnath Goenka why he wasn’t giving his editor an extension of contract. “He is such a saint, I can’t believe you don’t want him for longer,” complained the eminent friend. Let’s start counting. There is the Congress, led by India’s most prominent new Shiv-bhakt, with four allies of reasonable reliability: Sharad Pawar’s NCP, M.K. Stalin’s DMK, Lalu Yadav’s RJD and H.D. Deve Gowda’s JD(S). Let’s call it the second front (NDA being the first). Then, the SP and the BSP are going their own way together in an Uttar Pradesh ‘gathbandhan’. As things stand, in the election campaign, these two will attack the BJP, but also the Congress, and vice-versa. Let’s call them the third front, if only for convenience. Yet another alliance of sorts is now on display with Mamata Banerjee’s show of strength. 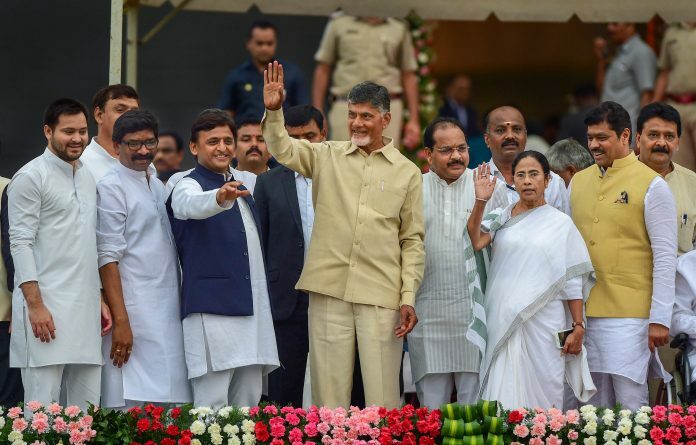 This includes the Congress, the SP, the BSP, and many of the reigning regional satraps, including the DMK, Chandrababu Naidu’s TDP and Arvind Kejriwal’s AAP. This is some kind of a fourth front. Then there’s Naveen Patnaik’s BJD, the TRS of K. Chandrashekara Rao (KCR) and Jagan Mohan Reddy’s YSRCP, who are out of all these groupings, and waiting for a break some place. These are our fifth, sixth, seventh fronts and so on. This can be sliced and diced further. If you look at Mamata’s stage, the Congress and the AAP are there, but still bitter rivals in Delhi and Punjab. The TDP has not yet sealed an alliance with the Congress, given the uncertainty over the mutual transfer of votes after the debacle of Telangana. The SP and the BSP are set to fight the Congress to a repeat humiliation in Uttar Pradesh. Patnaik, as always, is keeping his options open. His is the least ideological of all regional parties. He can afford to be, because he has almost no dependence on the Muslim vote. Barring the Congress, none of these parties can reach the number of 50. Their best hope: Keep the BJP below 170, the Congress at 100, and then build an alliance of the rest that forces the Congress to support it from outside. The last time we saw this movie, it was called Deve Gowda’s United Front. In such an election, each one of these stalwarts would see a chance for tenancy at Lok Kalyan Marg, however short. Being a former prime minister for the rest of your life is better than being a former chief minister. In 1996, late comrade Harkishan Singh Surjeet had to conjure up a Deve Gowda from some place. Today, the opposition has a gaggle of “main-bhi-Gowda” wannabes. The opposition’s disunity, conflicting ambitions, personal antagonisms and the one-point agenda of “Modi Hatao” have convinced them that India is headed for a 1971, Indira-versus-the-rest kind of election. Where all pundits added the voter arithmetic and pronounced that she was going to lose, and she won a landslide on the slogan of “Garibi Hatao” versus “Indira Hatao”. In a state election, as in Madhya Pradesh, Rajasthan or Chhattisgarh, you can go against the incumbent without a chief ministerial candidate. Your voters know the two or three contenders within your party and are not particularly polarised in terms of personal loyalties. In a national election, it is dangerous to say we will fight Modi state-by-state, and also each other at the same time. He will turn it into a ‘so, which among these will be your new Gowda’ campaign. He can, and will, then cut you down piecemeal. Second, in 1971, it was still possible for major opposition parties, especially in the heartland, to be united only by sheer anti-Congressism. Today, there is strong anti-BJPism, but the competing anti-Congress impulse endures. The prospect of a broken mandate is encouraging many of these below-50-seat stalwarts to fantasise about a non-BJP, non-Congress government. The most vocal proponent of this is Telangana’s KCR. Even if the BJP and the Congress together count for less than 250, there is no way the rest could reach 272 without one of these big two supporting them from outside. That means a prime minister on daily wages, like V.P. Singh, Chandra Shekhar, H.D. Deve Gowda or I.K. Gujral. Any behavioral economist or even a IIM marketing graduate will be proud of this piece of writing. Suggest changing the title of this series from “National Interest” to “BJP interest” or better still, “Modi Shah Interest”. What an irony ! Raga pronounces himself a Shiv Bhakt. But, he chose to keep away from THIS ‘Shivji ki baraat’ . And, the baraat in its turn, has chosen to eschew the wannabe ‘Dulha’, who has declared himself the next King. Shekhar ji, Can you please arrange for Walk-The-Talk or Off-the-Cuff interviews with RG and NM? Thanks. His point of view. There are arguments and theories pro and against this. 1. It is perfectly okay for all regional parties to join hands to defeat BJP. Whether the Congress will be invited as a partner of United Opposition Front (UOF) would be clear in a couple of weeks. 2. My problem with UOF is that not one of the regional parties has a national presence or economic agenda. Further, so many regional leaders have Prime Ministerial ambitions. Hence, my view is that if leaders of regional parties like Mamata Banerjee, Sharad Pawar, H D Deve Gowda, M K Stalin and others wish that UOF be accepted as a serious contender for forming a government in the Centre after the coming LS election, then I think they should come out with a document called “White Paper” (WP). 3. The WP would have to be a comprehensive document that would enumerate UOF’s perception of (a) problems like lack of job opportunities in rural and urban areas both in organised & unorganised sectors, & consequent unemployment, (b) farmers’ problems arising out of climate changes & government policies, (c) farmers’ suicides and how the Congress party has dealt with this problem earlier and how it will with it after getting back in power, (d) inflation, and in particular difficulties of senior citizens who are not govt. pensioners, (e) existing deficiencies in GST and how to rectify them, etc. It is necessary that the WP provides full details as to how the UOF would deal with all these issues. WP should be released before UOF launches election campaign so that citizen-voters can study its content and then decide whom to vote. Shekhar is spot on in his analysis of the current state of the opposition. Perhaps unintentionally, he has provided BJP a ready script of criticism against these leaders. As one listens to speech after speech of the leaders rallying in Kokatta, it conjures up a very pathetic picture of the opposition. They are together just to save themselves from the onslaught of BJP and have nothing to offer to the voters except baying for anti Modi slogans. It is a sad state of affairs that not a single leader has come forward with any plan of action for creating jobs, reducing farm distress and improving industrial growth rate. If Modi has failed on these counts, how do they plan to succeed ? Hopefully, voters know this and will vote wisely. I was in high school in March 1971 when Mrs Gandhi won, before the victory of Bangladesh. Younger readers might mix the two events and believe she won because of the war; actually its aftermath, coupled with droughts, inflation, the oil shock took her down the slippery slope to the emergency. To the best of my recollection, there was not the sort of anti incumbency that is now visible. She had nationalised the banks, abolished privy purses, beaten back the old guard, was seen as pro poor, charismatic – though not much of a speaker – a worthy daughter to her father. The last few years have brought virtually the entire opposition together. People understand the reasons for this, do not regard this as a self serving or cynical exercise. 2. The Congress is done with feeding fishes and loaves to its guests from outside the dining room. It will be at the feast, even if not at the head of the table. The instability inherent in the largest party supporting a gaggle of satraps from the outside will not be repeated. For the Congress to claim the PM’s post, constitutional morality dictates it should get 136, say 140. Even 120 may be good enough, since the other baraatis will perform the crab asana. 3. Closer to the election, we look forward to National Interest columns predicting the numbers, statewide. It has done well in R / C / M. In Karnataka and Maharashtra it will gain seats with its partners. Modest gains in Gujarat, Punjab, Haryana, Delhi. Small bits and pieces virtually all over the country, starting from J & K in the north to Kersla in the south. Haathi mara bhi sava lakh ka. No one is a born groom; there’s a groom in every male (and its equivalent, in every female); and to quote a proverb, cometh the time and cometh the groom. I don’t remember what the proverb exactly says. I have seen this queer phenomenon in the media recently: TV channels that are pro Modi hold elaborate debates, full one hour debates, to hammer the point that “there’s no one” to match up to Mr Modi. These TV channels try to influence the gullible voter, imagining that there indeed is any “gullible” voter left in India after the 5-year reality check we all have been subjected to. What saddens me is the suspicion that even THE PRINT belongs to that clique. I would like to remind everyone of late PM Narsimha Rao. He was such a shocker of a choice that senior journalists of the time, like Shekhar Gupta is today, went out of their way to “sell” Mr Rao to us. Dilip Padgaonkar I think was the editor of the Times of India in those days, and he wrote nearly half a page of his paper to convince us what a great intellectual Narsimha Rao was. In hindsight it turns out that Mr Rao was a Zen kind of intellectual if he was one, who refused to read anything or hear anything or speak anything, at least not until the person who had asked the question had crossed the road and walked a few blocks away. Yet what an influential prime minister, in the constructive sense Mr Narsimha Rao turned out to be! Leaders emerge, let there be no doubt. And most men when they sit in the chair of power DO try to do good for the society. Ego satisfaction or regret that may result, are incidental. Narendra Modi is fundamentally different in that regard; he does things FOR ego satisfaction — good or bad that may result are incidental. See it in this light, and you will understand DeMo, Anil Ambani, even “beti bachao beti padhao” (yes! Try to figure it out)… Even Sardar Patel, uncooked, not even half-cooked GST, etc etc. Accepting blame will run counter to raison d’etre, i.e. ego satisfaction, so no blames are ever accepted. Anyone who tries to suggest that there is no alternative to Mr Modi should desist from doing so. A poor people do not need a leader like him. Be conscientious journalists, friends, and don’t make harmful insinuations. Cometh the hour, cometh the man, sir. Thank you, Ashok. Now cometh no man, but one bahenji! Frankly, I have always believed that it is not Goswamis and his ilk who are helping Modi but our esteemed Shekhar Guotas who, in their own clever way are working for him in the hope that he will be helpful in establishing neo-liberal capitalism and even religious majoritarian rule. He has been in his cut the clutter or other columns has subtly worked for Modi by briniging in compatison to the UPA Govt. or the Congress type fau socialism. He has always been against the social security or the amelioration of thousands of years of discrimination and exploitation. Even in the latest piece, he is looking for a Groom for Shivji`s Barat but ignoring the fact that what is being attempted by the Right wingsers is destabilization of the country in order to blame the Democractic rule and above all the Constitution which uphld equality before law and social upliftment. We should beware of the likes of Guptas than the Goswamis, Shivshankar, Kumar, Kanwals or Pandeys of the Paid channels. When we’re u born? Thousands of years of exploitation? LOL. Who exploited u?